WOULD YOU like to see our new toilet seat?” asks an excited Dianna Lee immediately after introducing herself. It is the last thing we expect but it is hard not to be infected by the group CEO of Country Heights Holdings Bhd’s enthusiasm. Grinning from ear to ear, she launches into an explanation of the new toilet seat and its health benefits. To recap, Lee had assumed her current post in late 2011. Thus, she oversees a much healthier Country Heights, which was badly hit by the 1997/98 Asian financial crisis and ended up in heavy debt. “In the past few years, we were busy doing housekeeping to fix our debts and the bottom line. So, we spent more on below-the-line activities and didn’t do many launches,” the 29-year-old tells City & Country. The group has improved financially, recording a net profit of RM35.1 million on revenue of RM262.8 million in its financial year ended Dec 31, 2013, up from RM32.9 million and RM253.7 million respectively in FY2012. Its gearing dropped from 32.4% to 23.8% due to the repayment of borrowings. Property development, and hospitality and health continue to be the pillars of the company. In FY2013, the two divisions contributed 56% and 35% respectively to revenue. “These two divisions are still the key drivers of our company’s growth. We are very conservative and we are not a big company. Our growth has been slow and steady. For our property division, we are setting a sales target of RM500 million for this year,” explains Lee. For her, property development is all about “meaningful innovative creations”. “We don’t really do mega projects of 1,000 to 2,000 units. Our projects are on a smaller scale of 100 to a maximum of 600 units. Our projects are done with a lot of heart; we want to be focused and in control. We are also sincere about our products and roll out what we are confident of. “After going through so many crises, we learnt not to get caught again. So, we do projects based on the resources we have. We try to get away from bridging loans to pare down our debt,” says Lee. Housekeeping also means things have to be done differently. While the company’s core values are still love, style, quality, nature and excellence, Lee has a different approach from her father, Country Heights founder and deputy chairman Tan Sri Lee Kim Yew. “But my philosophy is in line with his. I think we just interpret it differently. Previously, quality was about using the best and most expensive building materials. Now, we see quality as what we do when people are not watching. We don’t have to use the most expensive materials but they still must be of good quality and durable. It’s very important that we don’t cheat our customers. “The same goes for innovation. My father’s interpretation was to create the first in everything. Of course, we still want to create products that are the first in the industry but we also see innovation as creating different services, facilities and the likes. I would say that we complement each other well,” she says. Apart from Mines Resort City, which includes the Palace of the Golden Horses hotel, Country Heights is also well known for GHHS Healthcare (formerly known as Country Heights Health Tourism). GHHS was established in 2001 as a corporate social responsibility initiative. It is Malaysia’s first dedicated preventive health screening centre and is located in the Palace of the Golden Horses. “When we started GHHS, it was very hard to sell. It began with us distributing flyers to our residents about dengue, high blood pressure and so forth. We soon had a network of people and over time, it evolved into a business model. Today, we have about 30,000 paying members. Now, we are tying preventive healthcare with property development,” explains Lee. The merging of healthcare and property development can already be seen in LakeView [email protected] Heights Villa, which comprises three 10-storey blocks of residences. Launched in 2011 and fully sold, LakeView is the first development to use negative ion energy boards, which work as natural air purifiers. “We try to create products that are good for our health. There is a lot of talk about green certification, which is important, but we should also look at building something that helps our health in the home. Now, all our products have negative ion energy boards,” says Lee. And, of course, the toilet seat she is so excited about will feature in Country Heights’ products, starting with its biggest project today — Mines Wellness City (MWC). The idea of MWC was conceived about four years ago after the launch of the Economic Transformation Programme (ETP). “We heard that the government wanted to create a wellness resort under the healthcare sector of the ETP and we thought to ourselves, ‘we already have a resort city (Mines) with healthcare services’. So, we approached the Performance Management and Delivery Unit (Pemandu) and showed the directors our plan. Pemandu responded quickly and listed MWC as an ETP project under healthcare wholesale and retail, and supported us by giving MWC tax incentives,” says Lee. 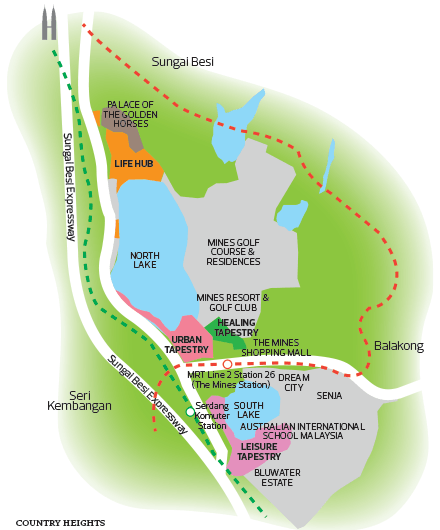 Under the ETP, Mines Resort City will be transformed and re-gazetted into MWC. The entire development is 1,000 acres, of which 120 acres are undeveloped. MWC is envisioned as a one-stop wellness destination for health, healing, recuperation, residential, leisure, learning and entertainment. It has a gross development value (GDV) of RM11 billion and will be developed over 10 years. Offering about 36 million sq ft of new space and almost 15,000 new homes, MWC is expected to contribute up to RM5 billion to gross national income and attract potential foreign direct investment of over RM3.1 billion. Tax incentives include 100% tax exemption for property developers on income derived from the disposal of land and building in MWC from years of assessment 2013 to 2023; income-tax exemption on income derived from providing management, supervision or marketing services to developers in MWC; and 70% income tax exemption for income derived from qualified activities in healthcare services or complementary and traditional healthcare services carried out in MWC. As Lee points out, healthcare and medical tourism in Malaysia are growing. According to the Malaysia Healthcare Travel Council — an initiative of the Ministry of Health — the number of healthcare travellers to Malaysia increased from 341,288 in 2007 to 770,134 in 2013. With Malaysia expected to become an ageing nation by 2035 and the younger generation being more health conscious, the domestic market for healthcare services is also growing. Lee believes Country Heights’ focus on preventive healthcare is unique and will cater for such a population. “We have split the 120 acres into four zones — Life Hub, Urban Tapestry, Healing Tapestry and Leisure Tapestry. Life Hub is where we will have modern and Western medicine. Healing Tapestry is where the complementary and non-mainstream medicine, such as traditional Chinese medicine and traditional Indian medicine will be located. Urban Tapestry and Leisure Tapestry will comprise mainly commercial offerings such as offices and retail space,” she says. Of the potential 36 million sq ft of space, two-thirds will be residential and one-third commercial. “Our idea is to create a one-stop wellness centre to which people come for healthcare services. We will also take care of the secondary needs of the families. So, there’s shopping, hotels and entertainment. It’s one-stop in terms of medical tourism and healthcare,” says Lee. “When we started Mines Resort City, it was focused on MICE (meetings, incentives, conferences and exhibitions). We are now moving into an economy that prefers healthcare and a community that focuses on healthcare. That is why we centred our developments on healthcare,” explains Lee. Country Heights has organised roadshows locally and internationally in China, Taiwan and the Middle East, targeting specific stakeholders and players in the health and wellness industry. The first phase of MWC is a five-year plan that comprises Mines Waterfront Suites, Aqualis, Palace Residence Suites and Trousdale. Mines Waterfront Suites, which was launched in 4Q2014, consists of two towers of 272 designer suites. Priced from RM380,000, it is almost 60% sold. Two more towers will be launched later this year. “Mines Waterfront Suites has a medical suite concept and we will have dentists, general practitioners, pharmacies and others, including a spine centre,” says Lee. Aqualis is a high-end development comprising four towers of 175 serviced apartments each and a total of 20 retail units. 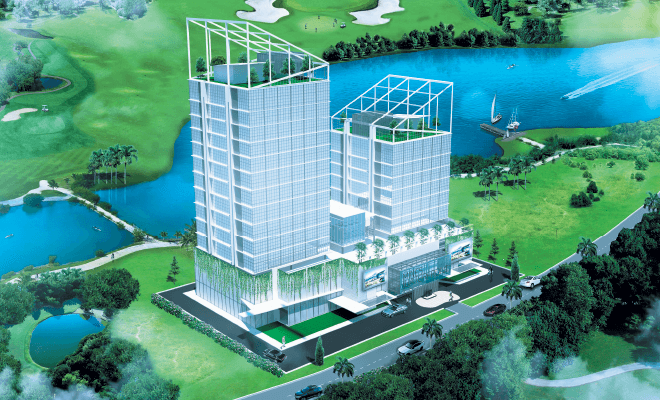 It has a GDV of RM347 million and its units are priced from RM360,000. It is scheduled to be launched in 3Q2015. “Aqualis will also have the world’s first gym home, featuring a gym floor. I can’t reveal much about how it works at the moment but I can tell you that we are targeting the younger crowd for this product, including the second generation of our existing customers. The units are smaller — between 500 and 1,200 sq ft — and we already have over 800 registrants,” says Lee. Comprising 322 units that are priced from RM700,000, Palace Residence Suites is located next to the Palace of the Golden Horses. It will be launched in 1Q2015. Trousdale’s 262 units are priced from RM344,000 and will be launched later this year. Also coming up in the next few years is Venice North street mall. Country Heights will undertake the first phase on its own to create a catalyst for the entire development and plans to retain some of the properties for investment purposes. However, says Lee, the group will not be able to develop the entire 36 million sq ft by itself. “We already have a partner to develop Leisure Tapestry and we are still looking for partners for the other zones. We need their financial strength to go ahead with the project. However, we want partners who share our vision and ideas. We will take a stake in the joint ventures as landowner while the partners will be the developers,” says Lee, who declines to reveal the partner for Leisure Tapestry. She says she is thrilled by the response to Mines Waterfront Suites, noting that some quarters had been sceptical about the project. “The highest price we sold Mines Waterfront Suites for is RM942 psf. We have put a lot of hard work into making this product. I believe the reason we received so much support is that we are not a greenfield site. It’s easier for us to spur the economy because we are not starting from scratch. We have already spent RM2.5 billion on the entire development [when it was Mines Resort City]. The population and infrastructure are already in place,” says Lee. 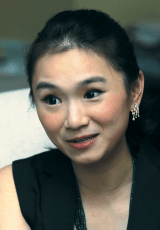 According to C H Williams Talhar & Wong Sdn Bhd managing director Foo Gee Jen, the demographics of the area have changed over the years and more people from KL and PJ are moving there. “However, if the residences are serviced apartments targeted at expatriates, they would be more difficult to sell as most of the residents are locals and not many expats are looking to relocate there. “As a healthcare hub, MWC will benefit from its close proximity to Bandar Malaysia in Sungai Besi where the Malaysia-Singapore high-speed rail terminal will be located. This can bring in the Singaporeans and those in the northern states looking for healthcare services,” says Foo. In line with its focus on healthcare and the younger market, Country Heights will be launching the Health United Card this year, which will offer special privileges, such as discounts, for anything from health food to health services. The participants include Gleneagles Hospital, Brand’s Essence of Chicken, Fitness First and Osim. “The idea is to unite all health-related services, food and products on one platform and it can be used in MWC as well. We want to reach out to the younger generation. A lot of people don’t think about their health until they are about 45 years old, so this is a way to make health relevant to the young,” says Lee. Country Heights is spending about RM2 million on rolling out the card and will be holding several events, including a health carnival in Mines Exhibition Centre, from April 16 to 20. “The health carnival will be the first Health United event and unlike other health-related events, we will not focus on just conventional healthcare. Health is not just about the body, it’s also about the state of mind. Sometimes you feel good just by putting on a new pair of earrings or having a pedicure. So, we will also have fashion in our carnival. We are targeting at least 300,000 people for the exhibition,” says Lee. Also scheduled for launch is Phase 3 of Belleza Garden Homes in Kedah in the next few months and a mixed-use development in Port Dickson in 3Q2015. Phase 3 of Belleza Garden Homes comprises ninety 2-storey link villas and has a GDV of RM35 million. The Port Dickson development will comprise a hotel, serviced apartments and retail space. It has an estimated GDV of RM440 million. This article first appeared in City &Country, The Edge Malaysia Weekly, on February 9 - 15, 2015.